Blended in meticulous proportions to create the dishes we present to you. Each dish will have its own distinctive flavor and aroma, which cannot come from any curry powder, but from, spices which have to be separately prepared each day fresh for each individual dish. Our traditional dishes are rooted in the soil of Northern India and they are prepared in our restaurant as they would be in our own homes. Great food should be savored and enjoyed with the people you love. 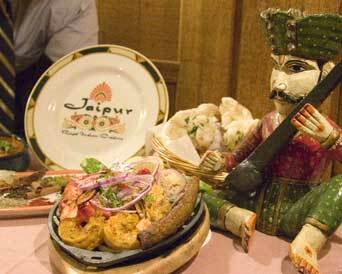 Friends, family, coworkers will love our incredible menu of delicious Indian food at Jaipur Royal Indian Cuisine. As a premier Indian Restaurant, our customers frequently say we are the best Indian Restaurant serving the Fairfax area! Everything we have to offer is served fresh and made from the finest traditional ingredients. Known as the Pink City, Jaipur is one of the jewels of Rajasthan, a northern Indian province west of New Delhi. The restaurant's name did not come by chance; it is the original home of the manager and the chef. Because we are known to serve the best Indian food around, it's important to us that every dish maintains its authentic ancestry rooted deep in our traditions. To help you enjoy your meal, the décor of our Indian restaurant includes rows of beads adorned with brilliantly colored birds and a contingent of elaborately dressed puppets. Stunning paintings by Indian Artists and the interior design in accordance with the principles of Rajasthan’s Royal Palace. All of this adds to the experience of enjoying the rich flavors that come from our traditional Indian Cuisine. Blended in meticulous proportions to create the dishes we present to you. Each dish on our menu will have its own distinctive flavor and aroma, which cannot come from any curry powder, but from spices which have to be separately prepared each day fresh for each individual dish. It is this attention to detail and creating a unique dining experience that sets our Indian restaurant apart. Our traditional dishes are rooted in the soil of Northern India and they are prepared in our restaurant as they would be in our own homes. We strive to create an authentic atmosphere where you and your guests will be able to sit back and enjoy the rich aroma and our incredible Indian cuisine. To reserve a table, call 703-766-1111.